All cyclists should time their start to arrive at 1st Nosh Stop at Red Herring Café, Brooklyn at 8:30am. Ride Organiser: Phil aka BankTeller 0434 715.861, Pete aka CampyAficinado, Jane aka NeoLuddite, PacificPete and Ann aka ToothFairy are starting from Hornsby at 7:30am. If you think you are >80% of joining us, can you e-mail Scribe, and he will add ya. Separate starts from Nth Turramurra shops or 200m NW of Hornsby station cycling North up Old Pacific H'way, to 1st Nosh Stop at Red Herring Café, Brooklyn. 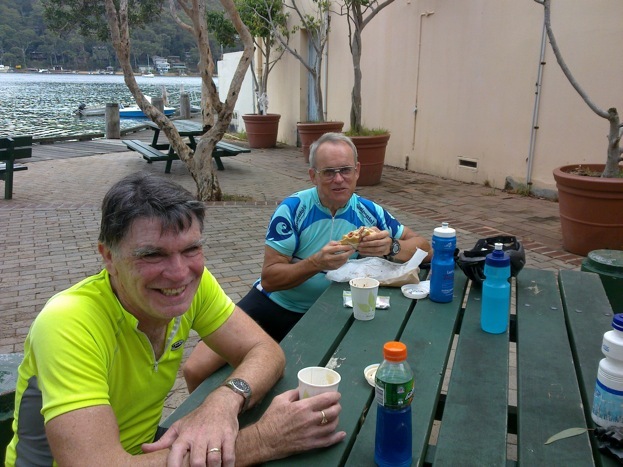 Thence 11km retracing to turn right at Berowra Waters Rd to Nth Galston for lunch at Andy's Cafe. Return via Galston Gorge and Bobbin Head. Park in Nth Turramurra village car park (700m NNE of Burns Rd) in Valley Park Cres (little road off to the left of Bobbin Head Rd opposite the Corner Café on LHS) for 37km leg to Red Herring Café Brooklyn. Rollout 7:00am passing Kalkari Reserve after 10.2km. 4 clicks later, R into Pac Highway at lights after passing Asquith Golf Course. Then due Nth on Old Pacific Highway. Rollout Hornsby car-park [100m Nth/West of Railway Hotel in Jersey St] by 7:30am cycling 500m Nth up Jersey St, L into Wharf Rd for 60m, R [at traffic lights] onto Pacific Highway and cycle Nth on Old Pacific Highway to Brooklyn Rd where you turn right and cycle 2.8km to Red Herring Café. Both groups pass Berowra station 7:50am, Cowan station 8:00am and Pie in the Sky Cafe at 8:10am. After passing Pie in the Sky Cafe descend almost to water level, R turn into Brooklyn Rd for 2.8km for 1st Nosh Stop (30 min) at Red Herring Café, Brooklyn from 8:30am. 9:00am return for 11km and R into Berowra Waters Rd for flattish section before descending to picturesque Berowra Waters 10:30am for 2nd Sag Stop (10 min) during ride on the punt. Or continue south and return to either Hornsby [52km] or Nth Turra’ [75km] car parks. 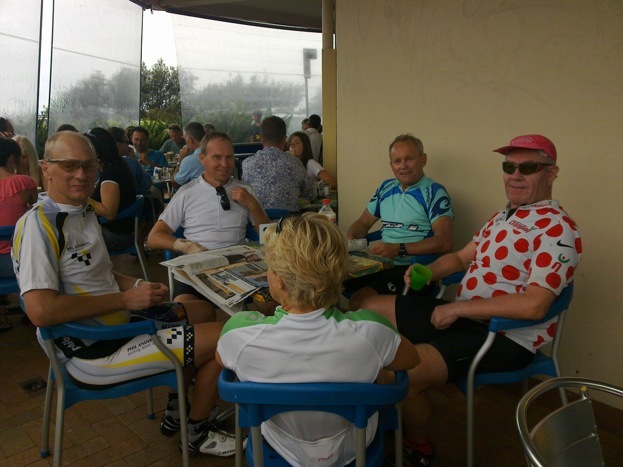 After cycling thru rural Berrilee and Arcadia we take 2nd Nosh Stop (25 min) at Andy's cafe from 10:25am. 10:50am commence return home continuing South along Galston Rd to the large roundabout at Galston, Left to descend and scale Galston George passing familiar Hornsby Heights' bus shelter. ¨ L 2.5km up Pacific H'way to Asquith station, then off-road to Royston Ave thru backstreets of Asquith, R in to Ku' ring' gai Chase Rd, Ahead into Bobbin Head Rd for 15km to Nth Turra' shops on Bobbin Head Rd - ETR 12:05pm. Ø Do not cycle over the metal girders on the ramp at the Berowra Waters ferry, if you opt to cycle off the ferry, 'cause you will come down hard, like many before you. 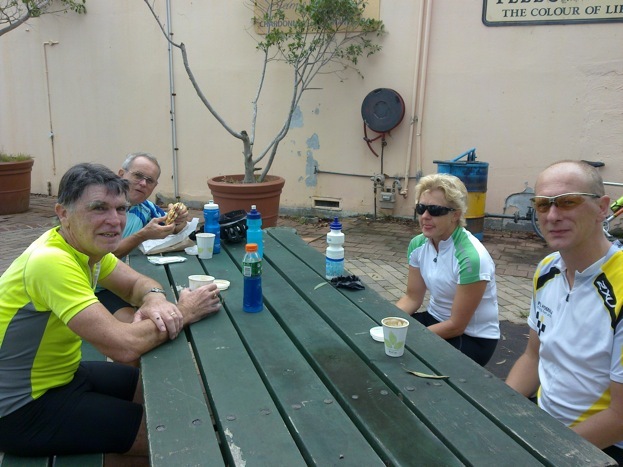 Bank Teller's rap-up of Coastal clockwise Sortie - 77km - 6 cyclists when you count Peter aka CampyAficinado after 1st Nosh Stop at Church Pt.